In 1995, a man by the name of Irv Kaufman quit his job at a local mobile home factory, and started a full time business building kitchen and bath cabinetry for houses. The business was called Kaufman Kustom Kitchens and operated out of an old barn. Irv’s wife worked in Newmar’s Kountry Klub office & received many requests from RV owners for cabinetry and wood products. So in addition to building kitchens, Irv started designing and building custom cabinets and desks for RV’s, this eventually becoming the main part of his business. In 2008, Irv was wanting to slow down and retire, and he wanted to pass the business on and keep it going. So I, Gene Miller, an Amish neighbor of Irv’s, started working with him and bought his business in July of 2008. I continued the company’s tradition of building superior quality cabinets and unique woodworking items for RV’s and homes. Our business is based on Christian values, and each product that we build is made with heirloom quality craftsmanship. 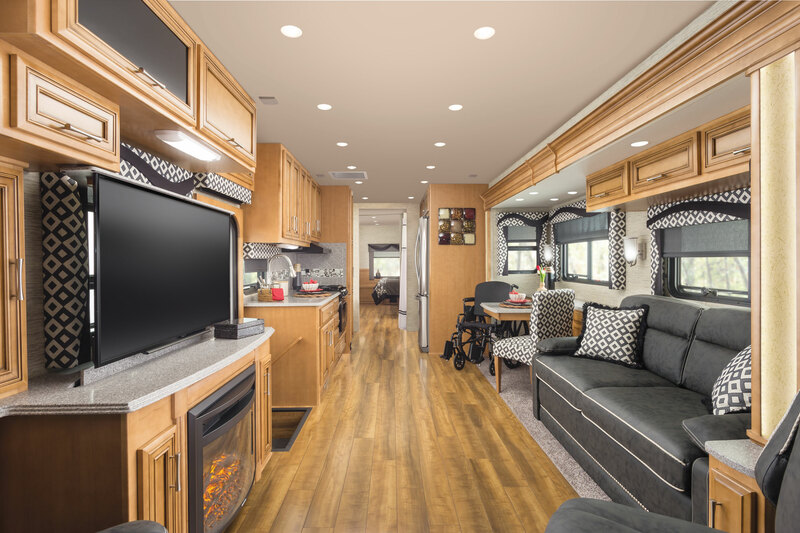 We build all kinds of custom cabinets and RV products designed to make your life easier, and update the interior of your coach. We also build high quality residential kitchen and bath cabinetry, as well as custom furniture and other wood products. We have added many new products and have expanded our machining capabilities to be able to handle variety of projects. We will build whatever you want if it possible for us to do so, and we welcome any challenges and new ideas that you may have. Our goal is 100% satisfaction, and it shows with every happy customer we send down the road. In 2011, the name was changed to Country Craftsman Woodworking LLC. The shop is located in the heart of Nappanee’s Amish country, and is approximately 1 mile South and 2 miles East of the Newmar Factory. Come out and enjoy the peace and quiet of Amish country, and let us bring your next project to reality!! We build all kinds of custom cabinetry and wood products for RV’s and the Residential market. Our products are built with high quality hardwood and materials, and are finished to match your color and decor. We specialize in building custom projects and we can bring your dream project to life. We can help you start from scratch, or take your ideas and do a design from them. Our prints are drawn in a 3D software and we can provide you with a high quality 3D rendering of your project!! This allows you to visualize and see what your new cabinet will look before we even start building!!! This also makes it very easy to do any changes you might have and make it just the way you want it to be. We will take in consideration any ideas you might have, and will strive to incorporate them into your project if it is possible!! We are easy going and fun to work with!!! Call us today and give us a try!! Our mission is to provide the highest quality service and products possible. We stand behind our products and will repair or replace anything that does not meet your expectations. We will take care of you, and we do our absolute best to make sure that you are happy. We are a Christian company and have high moral standards and believe in treating others as we would want to be treated. We try to be flexible to accommodate short notice schedules and emergency repairs if such a need arises. This however, is not always possible and it is highly recommended to schedule your appointment well in advance. We keep you informed on the status of your project, and will involve you in making decisions and planning. Our goal is 100% satisfaction, and we work very hard to achieve that.